The multi-talented artist, curator, film director—and your correspondent’s one-time Russian publisher—Fyodor Pavlov-Andreevich is known for his extreme and provocative actions. These have included gate-crashing last May’s Met Gala wedged naked into a plastic box as a “Foundling” and, in 2009, participating in Marina Abramovic’s performance fest at Manchester’s Whitworth Art Gallery with just his mouth on display for visitors to feed. His latest series, Temporary Monuments, finds Pavlov-Andreevich using his body to address the issue of contemporary slavery. His stunts have included durational stints lashed naked to a palm tree in Brazil and being suspended 25 metres from an industrial crane up above Moscow’s Winzavod Contemporary Art Centre, trailing a banner declaring “Freedom to the Slaves” in protest of Russian treatment of labourers from Central Asia. 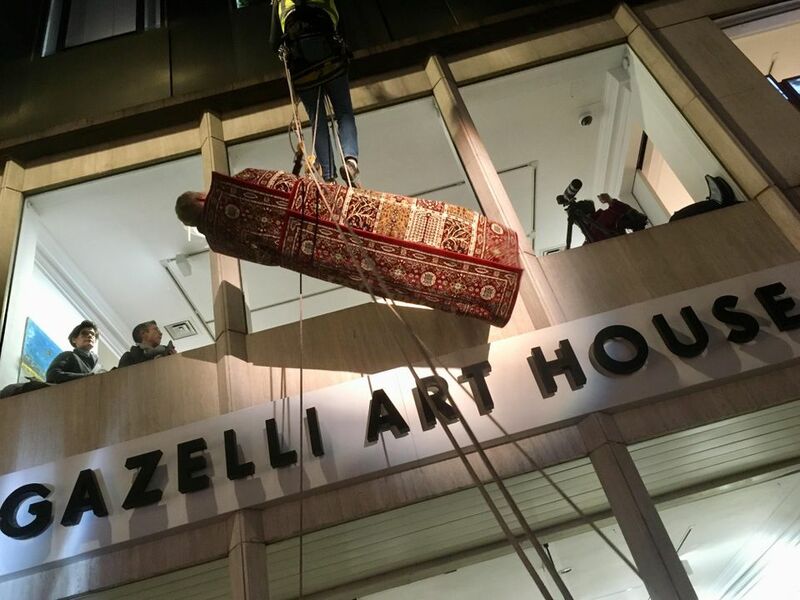 Last night, the intrepid artist-campaigner was yet again testing his physical limits—whilst also drawing large crowds and stopping traffic—by dangling precariously for five hours outside the upper floor window of Gazelli Art House in Mayfair’s Dover Street. This latest incarnation as Temporary Monument 0, involved wrapping himself in a rug of traditional Caucasian design (associated both with prayer and the wrapping of corpses). The aim of this suspended stint was to raise awareness of another kind of subjugation, namely the plight of the LGBT community in Chechnya, who are suffering acute persecution at the hands of the Chechen authorities. Although, for once, not physically baring all and appearing securely wrapped, apparently the acute discomfort of his London performance was second only to another earlier Temporary Monument work, which had involved being suspended from a tree by one ankle for hours on end. However, last night’s pain was considerably eased by the knowledge that whilst Pavlov-Andreevich was suffering for his art and for the cause, sales of the accompanying limited edition print had raised substantial sums for the Russian LGBT Network. This St Petersburg-based charity has organised the rescue of gay individuals persecuted by the Chechen police since March 2017. You can also donate money directly to the campaign.